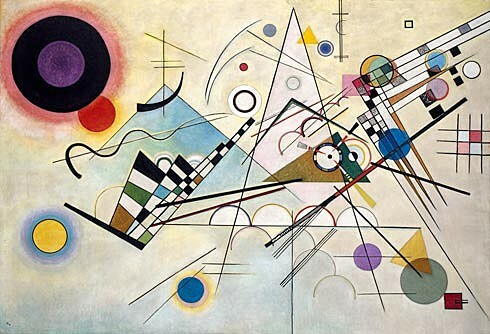 A pioneer of abstract art and eminent aesthetic theorist, Vasily Kandinsky (b. 1866, Moscow; d. 1944, Neuilly-sur-Seine, France) broke new ground in painting during the first decades of the twentieth century. His seminal treatise Über das Geistige in der Kunst (On the Spiritual in Art), published in Munich in December 1911, lays out his program for developing an art independent from observations of the external world. In this and other texts, as well as his work, Kandinsky advanced abstraction’s potential to be free from nature, a quality of music that he admired. The development of a new subject matter based solely on the artist’s “inner necessity” would occupy him for the rest of his life. 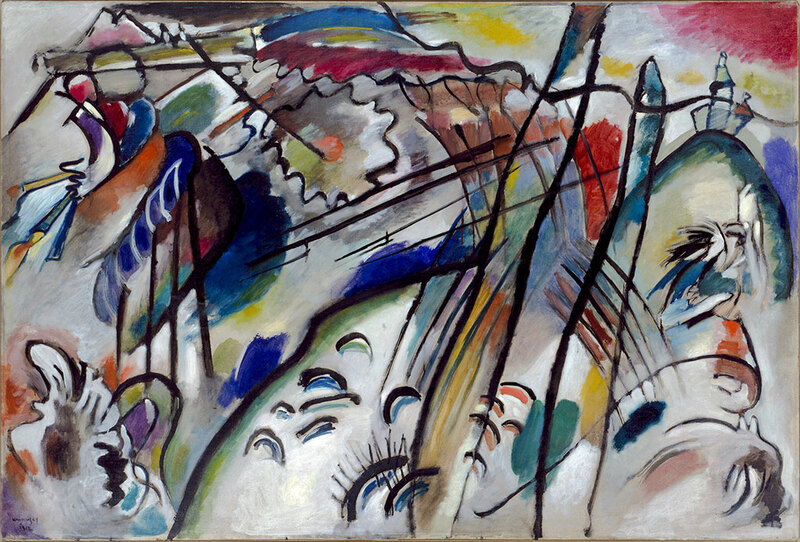 This presentation of select works from the Guggenheim collection traces Kandinsky’s aesthetic evolution: his early beginnings in Munich at the start of the century, the return to his native Moscow with the outbreak of World War I, his interwar years in Germany as a teacher at the Bauhaus, and his final chapter in Paris. 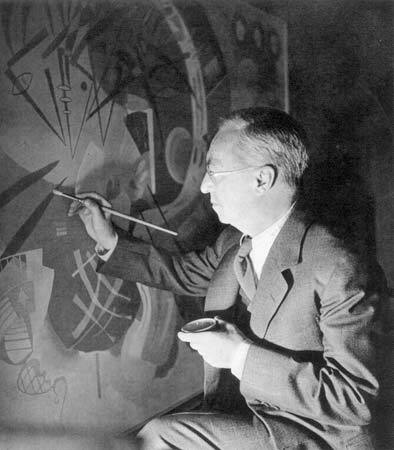 At the age of 30, Moscow native Wassily Kandinsky had a comfortable career teaching law and economics, and he gave it all up to enroll in art school in Munich. When Kandinsky returned to Moscow following the outbreak of World War I, his early impressionist style hardened into a more avant-garde, geometric pictorial vocabulary. The paintings — once filled with compositional elements taken from nature and resembling clouds, the sun, mountains, and references to the landscape painting tradition — devolved to geometric and basic biomemetic keys which heralded a new vision of what art could become. Works like Kandinsky’s “Composition” series became lynchpins of abstract painting and inspired generations of painters to follow suit in their search for new forms of expression. 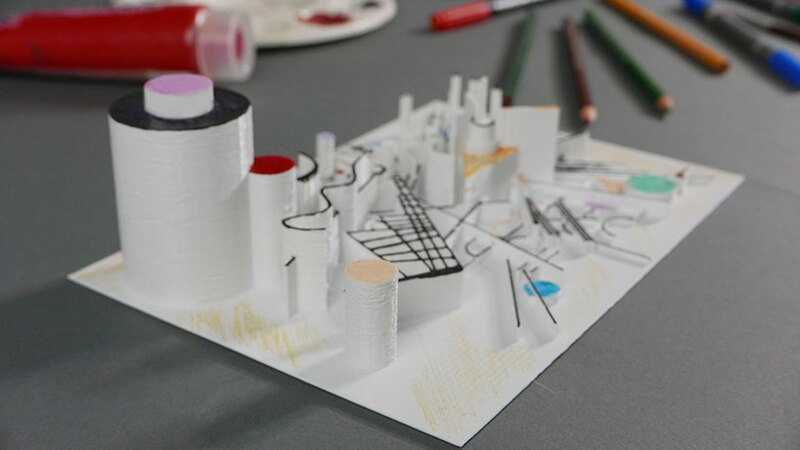 And now three former Autodesk employees who worked on AutoCAD for mobile have looked to the past to create new software which brings 3D printing to bear on the future of design and artistic expression. Meyer says the process of making the piece wasdivided among different tools and methods. The team started by sketching the geometric shapes and lines using their app, UMake. Once the original sketches were complete, the result was exported to the IGES file format and refined with Rhino 5. The 3D design for printing was fleshed out by filling any gaps and sharpening details, and then the files were taken to TechFactoryPlus for output on a Witbox 3D printer. Meyer says his nascent company is launching a private-beta this week, and he adds that the software will support iPad 3rd generation or iPad Mini 2 and up when running iOS 8. He says the purpose of the beta program is to test the user experience for UMake to see how improvements can be made to enable more people to make 3D designs easily and intuitively on their tablets. Would you be interested in 3D software like UMake for your tablet? Let us know if you plan to sign up for the UMake beta process in the Painting Meets 3D Design and Printing forum thread on 3DPB.com. Check out the video below of the production process for turning the 2D painting into a 3D sculpture. The Kandinsky Effect are a modern jazz trio where two members are credited with “effects” in addition to their own instruments. Drummer Caleb Dolister has his hands full, keeping a steady tempo for an open-ended band that teeters between jazz and electronic post-rock. So it’s up to saxophonist Warren Walker and bassist Gaël Petrina to give the Kandinsky Effect the extra textures of echo, loops, and general sonic butchery that keeps them ahead of their jazz-rock competitors.